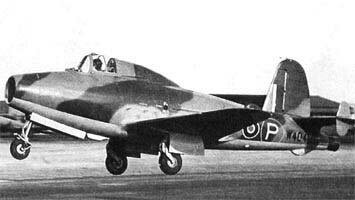 Gloster E.28/39, powered by a Whittle jet engine. 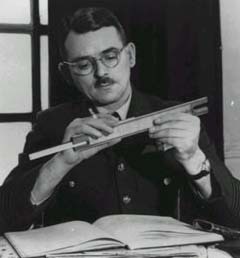 Frank Whittle was an English aeronautical engineer and pioneer of the jet engine. His engine was the prototype of turbojets used in many modern aircraft. Whittle was born in Earlsdon, a village which is part of the city of Coventry, Warwickshire, at a time when powered flight was still in its infancy. His boyhood coincided with the use of aircraft in the World War I, the formation of the RAF in 1918, and Alcock and Brown's flight across the Atlantic in 1919. Whittle grew up in an engineering environment, his father owning a general engineering business in Leamington Spa, and was particularly fascinated by aircraft. His interest in aviation was apparently sparked after seeing aircraft land on nearby Hearsall Common. The story goes that a plane came into land and blew his hat off, giving him the idea for the jet engine. After leaving school in 1923, he joined the RAF as an apprentice aircraft fitter. In 1926 he was selected for pilot training and entered the Royal Air Force (RAF) College in Cranwell in 1926 as a flight cadet and soon qualified as a pilot. He was posted to a fighter squadron in 1928 and served as a test pilot in 1931–32. The planes of the 1920s, powered by piston engines with propellers providing the necessary thrust, were limited with respect to speed and altitude – as they would be for another two decades. 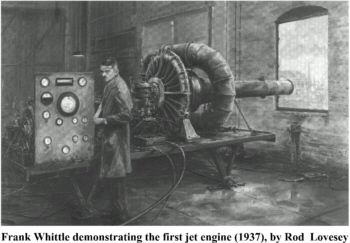 But while at Cranwell, and aged only 21, Whittle began to consider the possibilities of jet propulsion. His senior thesis presented in 1928 set out his ideas for jet propulsion, but they were ridiculed and neither the government nor private industry would support him. By 1930 Whittle had designed and patented his jet engine. Still many people refused to believe that his invention would work at all. The Air Ministry was approached, as were various industrial firms, but all were put off by the practical difficulties and high costs involved in making the engine: Britain in the 1930s was in the middle of a serious industrial depression and money for new products was limited. With no one to back him, Whittle could not even afford to renew his patent. By 1935 he had almost given up hope that his ideas would ever be developed. He was then at Cambridge University, where the RAF had sent him to work for a degree in mechanical engineering. In May of that year, he was approached by two ex-RAF officers who suggested that they should cooperate to try to get work started on the jet engine. Whittle agreed, although he was not very optimistic. However, this proved to be the turning point. By 1936, some money had been obtained, a small company, Power Jets Ltd, was formed and work on the first experimental engine started at the British Thomson Houston (now GEC) factory in Rugby. In April 1937 the first engine was ground-tested. According to Whittle it "made a noise like an air raid siren" causing onlookers to run for cover. Nevertheless, the demonstration was successful. Whittle's successful ground-testing in 1937 is generally taken to mark the practical invention of the jet engine. However, the first jet engine to be flown was designed in Germany by Hans von Ohain. Von Ohain's engine powered the first jet-aircraft flight on Aug. 27, 1939. The Air Ministry now began to take an interest and in 1939 gave Power Jets Ltd. an official contract for a flight engine. Subsequently, the Gloster Aircraft Company was asked to build an experimental aircraft. The result was the Gloster E.28/39, which, powered by the Whittle jet engine, took off from Cranwell on May 15, 1941, on an historic 17-minute flight. The British government took over Power Jets, Ltd. in 1944 and in the same year the renamed Gloster Meteor equipped with the Whittle engine entered service – the RAF's answer to Germany's jet-powered Messerschmitt Me 262s. Whittle retired from the RAF in 1948 with the rank of air commodore and was knighted that same year. He received the Churchill Gold Medal of the Society of Engineers in 1952 and was awarded the Order of Merit in 1986. In 1977 he joined the faculty of the U.S. Naval Academy, Annapolis, Maryland, as a research professor. His book Jet: The Story of a Pioneer was published in 1953.